I should have reposted this sooner–been a little behind recently. This is Chuck’s post on his own blog. I’m reproducing it in full. If you want to comment on the original, just click the link. Otherwise, read on. 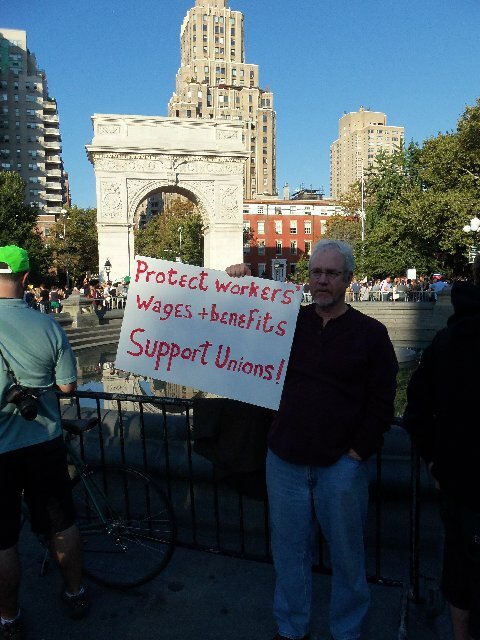 Eight days ago I went up to Washington Square Park in New York city, carrying the sign pictured here, to see for myself what all the Occupy Wall Street protests were about. It was beginning to garner some media attention with predictable results from the print pundits and AM radio shouters. To the Fox News propagandists, the protesters were castigated as “unwashed hippies and anarchists.” On the left-wing blogs and websites they were lauded as “radical revolutionaries.” As usual, both takes on the protesters were naive, silly and too frequently based on the biases of the reporter. No one was able to articulate a clear understanding of who was leading the protests or what they wanted. I have my own biases, of course, but I am growing confident the Occupy Wall Street protest is not going to go away any time soon. It’s gaining traction by the day. A particularly harsh winter may slow it down (conservatives like New York’s Mayor Bloomberg are crossing their fingers) but my gut tells me by the end of November it will be too big to ignore and it may help shape the public agenda for the 2012 Presidential elections. The signs I saw last Saturday in Washington Square poked fun at both the left and the right. There were plenty of signs attacking Wall Street and lambasting the GOP as the “Party of Greed.” But there were also plenty of signs reprimanding the Obama administration for wasting the nation’s treasury on foreign wars, for bailing out the banks and for not prosecuting those most responsible for the economic meltdown and the mortgage fiasco. The protesters I spoke to were upset with the whole political system, with politics as usual. In that sense, they ARE kin to the uber-conservative libertarians who comprise the Tea Party. And like the Tea Party, Occupy Wall Street protesters want transparency in government and an overhaul of the political structure of the nation. They want tangible changes….but not the changes the Tea Party wants: less taxes and smaller government. What the Occupy Wall Street protesters want is a strengthening of the American middle class. They want the very wealthy to carry the burden of restoring America’s economic strength. Most of all, they want jobs. The overwhelming majority of them are Americans who are educated but can’t pay off their college loans because there is no work for them. They blame the two wars that George Bush started and the Bush tax cuts on the very wealthy for the broken American economy. But they blame Bill Clinton’s North American Free Trade Agreement on the erosion of thousands of American jobs over the last 15 years. They see the nation’s politicians catering to the interests of the monied elite, the same multi-millionaires who subsidize political campaigns and who help keep politicians in office. They see both parties as corrupt, the entire system in need of a shakedown. And their message is resonating with other disaffected, disgruntled Americans and it is resonating far across the oceans. It is a people’s movement and, so far, it has been following the blueprint Mahatma Gandhi used to gain independence for India: non-violent political resistance. Police antagonism only strengthens the will of the people; police brutality will only bring more people to the cause. Because there are ordinances against the use of bullhorns in New York City, the organizers of Occupy Wall Street have developed a unique way of communicating with the masses at their protests. It’s called “the people’s mic.” When someone wants to say something, he or she will stand on a park bench and shout out half a sentence or a phrase. Then the people in his immediate circle will shout the line back to the speaker. People who cannot hear the speaker can hear the chorus, so the message gets amplified. It is an encouraging template for Democracy in action. There were all kinds of people in Washington Square last Saturday. The first people I spoke to were a married couple in their late 60s who had flown from the Netherlands to bear witness to the growing movement. The husband had gravitated to me because of my pro-union sign and he suggested the unions needed to throw their weight behind the movement to help give it some direction. I didn’t disagree with him. Mine was about the only pro-union sign in the square. But I am not sure the movement needs the help of organized labor. Labor should support it, but it seems to have a life of its own now that is impervious to parties and platforms. It is a movement about justice. The people I saw at Washington Square were mostly young and well-educated. They are asking for a chance to make a difference in the world. That would start with jobs. But right now, they have a more important calling: they are seeking economic justice. Their message will not go away until justice happens. They are not revolutionaries. They are our sons and daughters. They want the same things we all want. They want a chance to live the American dream; a dream that speaks to all humankind. They are tomorrow’s leaders. We should consider ourselves blessed they are finally starting to assert themselves. 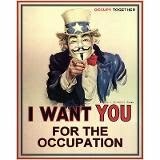 To hear more about the people who form the rank and file of Occupy Wall Street, please cut and paste this link into your browser and listen to an ABC interview with Fordham University professor of history Mark Naison.